It is not only Sen. Corker who will personally benefit from the tax bill so will other members of Congress. A list of who would benefit was provided by Sirota. As IBT first reported, the provision potentially enriching Corker, Trump and a handful of other top Republican lawmakers, was not part of the House- or Senate-passed bill, but was added by GOP lawmakers to the final bill, which was publicly released on Friday afternoon. Corker, who is not seeking re-election and is considered a crucial swing vote due to his criticism of President Trump, suddenly said he would support the final bill. He initially voted against the original bill in the Senate, which did not have the provision. Corker subsequently asserted to IBT that he did not know about the provision being added to the final bill, and he also declared he has not even read the tax bill he announced he is voting for. The provision at issue would provide a special tax deduction on income made from so-called “pass through” entities, like real estate LLCs. 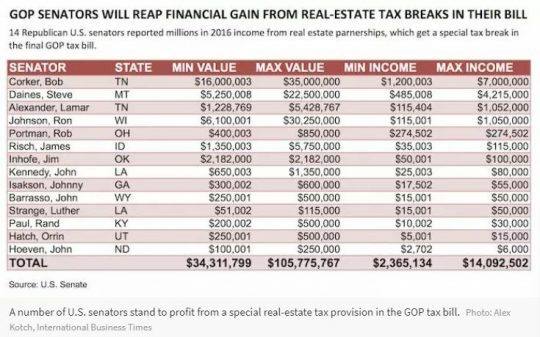 The specific language would provide the lucrative tax deduction for such entities, even when they employ few or no employees — a structure that tax experts say is designed to give a tax break to real estate moguls. Van Hollen disagreed, telling Stephanopoulos that the language was added in secret, and at the behest of special interests.